Shock waves ran through Japan in November after it was revealed that revered amateur archaeologist Shinichi Fujimura had planted findings of early Paleolithic relics at two of his dig sites. The anguish has since compounded among the nation's archaeological circles, officials at the Cultural Agency and concerned local governments, many of whom now doubt the veracity of other Fujimura findings. And the process of proving the authenticity of the finds by Fujimura, who was once known as the "God hand," may take years. Fujimura appeared before the press Nov. 5 and officially admitted fabricating discoveries at two ruins, one in Miyagi Prefecture and the other in Hokkaido. He claimed that all his other discoveries were genuine. The announcement came only after the daily Mainichi Shimbun published its findings, including photos that show Fujimura removing stone tools from a plastic bag and burying them at the Kamitakamori ruins in Tsukidate, Miyagi Prefecture. But doubts remain in archaeological circles, with some contending that all his digs, which date back more than 20 years, are bogus. The Cultural Agency has since instructed eight prefectural governments to re-examine findings from 33 sites where Fujimura participated in excavations. The central government is offering to shoulder half the estimated costs for the projects, estimated at millions of yen, but only the Tokyo Metropolitan Government and the Saitama Prefectural Government have set up investigative committees, according to the agency. A find of 13 pieces of stone tools in Tokyo between May and June 1987 is the only case involving Fujimura under Tokyo's jurisdiction. The items have an estimated age of between 30,000 and 40,000 years and are said to be the oldest in the southern Kanto region. A panel of scholars is set to re-examine the circumstances surrounding the findings at the Tama New Town No. 471-B ruins in Inagi, western Tokyo, where the 13 pieces were reportedly unearthed. Establishing authenticity through further finds is no longer possible at this site, however, as the ruins were destroyed when the hilly site was leveled for a future construction project. The committee must therefore analyze the stone tools from the perspective of form and substance and question participants in the excavation to ascertain the veracity of the findings. Despite the lack of hard evidence, circumstances suggest the findings at the Tama New Town site were genuine, according to Takashi Tateno, chief researcher at the Tokyo Metropolitan Archaeological Institution and a longtime acquaintance of Fujimura. Fujimura was unable to drive at the time of the findings, Tateno said, which would have made it difficult for him to act alone at the remote Tama New Town site. He added, however, that it was impossible to be certain. "Anything is possible," he said. "What if he fished a stone out of his pocket right before 'finding' it?" A similar committee in Saitama Prefecture is to reexamine 162 items that were reportedly discovered at the Nagaone and Ogasaka ruins in the city of Chichibu. With half of them unearthed by Fujimura, the claim that they were found in a soil layer dating between 300,000 and 500,000 years old is now being questioned. Committee members plan to re-excavate the two ruins, but when this can be done is uncertain as the sites are privately owned. Even without these obstacles in the field itself, determining whether relics actually date from the early Paleolithic period is difficult because there is a lack of genuine samples from the period. "Even if we were to use an authentic sample for comparison, these samples themselves come from Tohoku sites where Mr. Fujimura was actively involved in excavation," said a source close to the Saitama project. "There are re-examination efforts going on nationwide, but I don't think they can reach conclusions so easily. They cannot scientifically say the findings are 100 percent true or false," he said. "If Fujimura spent 20 years fabricating the findings, the re-examination may take the same time." The dilemma is viewed seriously in Japanese archaeoogical circles, particularly by Toshiki Takeoka, a lecturer in archaeology at Kyoritsu Women's University who was openly critical of Fujimura's "special ability" even before the faked findings came to light. 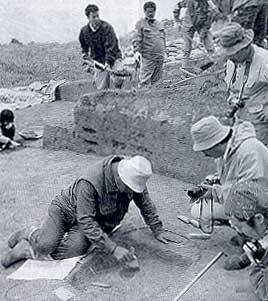 Takeoka has long claimed that Fujimura falsified the findings at most  if not all  of his excavation sites. Noting that stone tools characteristic of the early Jomon Period (10,000-300 B.C.) are interspersed throughout Fujimura's findings, which are said to date back to the early Paleolithic Period, he said, "it is like finding a calculator in Edo Period ruins." Until recently, his suspicions had been ignored. "After the revelation, many Fujimura believers changed their tunes and began to call me to say I was right." Soul-searching and fingerpointing among archaeological experts has predictably begun, with many citing reluctance to criticize peers, rigid hierarchy and feuds between rival schools in Japan's archaeological society as reasons for the embarrassing incident. At a Tokyo symposium last week, Hisao Baba, an anthropologist at the National Science Museum, said the strict seniority system was partly to blame as it discourages an academically critical spirit. "(Young archaeologists) do not challenge revered senior scholars," he said. "It is extremely difficult to directly deny others' works because it is taken as a grave personal and professional insult." It remains to be seen, however, whether the Fujimura incident will be the catalyst that changes the outdated structure of the Japanese archaeological scene. Tateno of the Tokyo Metropolitan Archaeological Institution said nothing will happen without a fundamental change in the nature of the Japanese archaeological society, a view shared by many others. What is happening now, they say, is that people who used to admire Fujimura are simply switching sides and "uncritically" criticizing him without analyzing the situation. Heated media coverage, they say, has added fuel to this tendency. Speaking at the Tokyo symposium, Michio Okamura, a researcher at the Cultural Agency, admitted to uncritically accepting Fujimura's findings. He also called for prudence, however, and described the current sentiment within academic circles as "like a pendulum swinging violently from one extreme to the other." "It is easy to say all of his findings are bogus. But I don't want to repeat the same mistake," he said. Tateno agrees: "The bottom line is, we're facing the same problem we were facing before and it is the very reason why Japanese archaeology has been criticized as lacking a scientific basis. The important thing is to ensure an environment in which people with opposing views feel free to speak out."